It been years since I preached from the lectionary, but I can't help but notice that this week's lectionary text from the gospel of Mark is about the beheading of John the Baptist. The text is Mark 6:14-29. So the marriage to Herodias wasn't a lawful marriage. Another interesting fact in this text is that Herod Antipas wasn't actually a Jew. 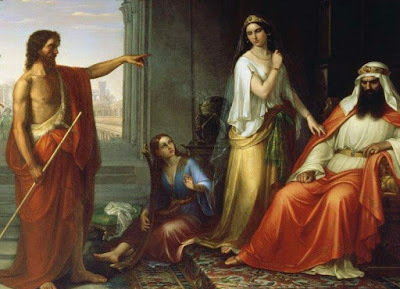 Even so, John tells Herod that he has violated the moral law of the Old Testament. Because Herod was the titular leader of the Jewish people, and was already disliked because he wasn't a Jew himself, the imprisonment of John served the political end of silencing a very unhelpful critic. So what is the takeaway here? It is this: John the Baptist was imprisoned and killed for preaching what God's Word says about real marriage. And why is this important today, Christian? You know why. The faithful preaching of God's Word can be costly. It starts with fines and gag orders and goes from there. But take heart! Jesus has overcome the world, and your inheritance is awaiting. Amazing how the Bible is always relevant for today.